Just in case you were looking for a recipe to turn your kitchen into a real mess, I've got one for you. Trust me. It works. Lazy veryniki come out great from your very first attempt. They make an amazing breakfast, lunch or snack or even dinner. We kept making them for as long for as I remember myself. However, though I normally succeed in cooking clean, lazy veryniki always leave me with a mess at the kitchen. If you solve this - my respect. 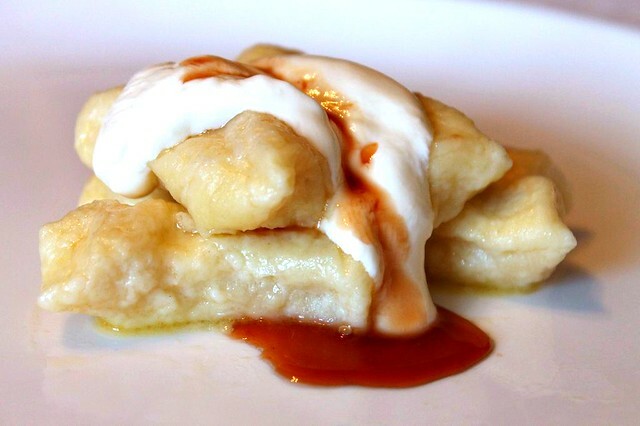 Lazy vareniki are the Ukrainian kind of cottage cheese gnocchi. For some reason in the Ukraine and Russia they are associated with normal vareniki (pierogi), that are dumplings with a filling inside (cottage cheese is one of the filling options). So they are called by the same word "vareniki", but are "lazy" in a sense that they are easier to make. Sometimes they are also called "galushki". Like for gnocchi, you make a quick dough, shape it into small pieces and quickly boil them in lots of water. That's exactly where the mess comes from. For rolling and shaping you need to dust all your working surfaces with flour. Then you cook lazy vareniki in batches and while you transfer them to the pan each time the flour tends to cover everything along your way. For our mixed Russian/Ukrainian family lazy vareniki are in the same cohort as syrniki and Russian cottage cheese bake. We make them on the weekend for late breakfast, but we always make more than we need for a meal. As we cook we pile them into a large ceramic bowl and top each batch with melted butter. Then we keep eating whenever the bowl catches somebody's eye - for lunch, between lunch and dinner, for dinner, as late night snack and so forth. Some people fry the leftover lazy vareniki in butter to heat them up and give them a new life, but we don't. I do believe it is very tasty, but they are so good just as they are, even a day or two after cooking, that we never bother. Everybody has own must complement to have with them. I prefer natural yoghurt, but a combination of sour cream with some home made jam is more common. In a large bowl combine the eggs with sugar and salt and whisk with a fork to get them combined. Add the cottage cheese and mix it in, making sure there are no big lumps left (it doesn't have to get perfectly smooth). Depending on how moist your cottage cheese is, the amount of flour needed can vary. First, add 100 g of flour to the cottage cheese batter. Mix well. The dough should stay very tender, but shouldn't stick to your fingers. If it sticks, add more flour. Dust a working surface with flour. Take half of the dough and shape it with your fingers into a bar around 1 cm thick and 3 cm wide. Dust a nife with flour and cut the bar into pieces 1 cm wide, so you get sticks 3 cm long, 1 cm wide and 1 cm thick. Place them on a floured surface. Repeat with the rest of the dough. Bring a large pan of water to boil. Add to the water 1 teaspoon of salt. Cook the lazy vareniki in batches of around 15. Place a batch in boiling water and bring the water to boil as soon as possible. Gently stir to prevent the vareniki from sticking to the bottom of the pan. In a minute or so the vareniki should float. After that cook them for 2-3 minutes more and take out with a skimmer in a slightly buttered bowl. Place a piece of butter on top and cover the bowl, while cooking the next batch. Add the next batch ready batch to the bowl, top with butter and continue in the same fashion. It is worth giving the bowl a slight shake up from time to time. Then the vareniki won't stick to each other. Serve them warm with sour cream and some good jam.